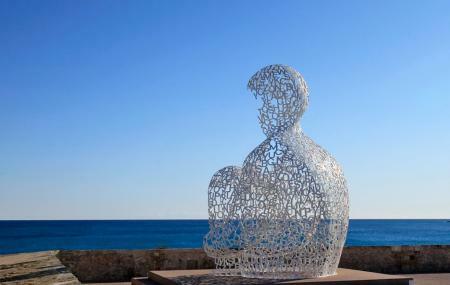 Le Nomade is a one of its type sculpture that beautifully stands out as a landmark in the city of Antibes. Pay a visit to this magnificent piece of art during your random coastal stroll to enrich your experience in the city of Antibes. Jaume Plensa the hand behind Le Nomade is one of the most important sculptors on the existing art scene. The sculpture stands tall on the road and hence the view doesn’t cost you any money. Timings do not matter; you can get a glimpse of the structure while passing by. How popular is Le Nomade? People normally also visit Fort Carre while planning their trip to Le Nomade. Beautiful piece of art. It's a huge person, sitting with his knees up. At least that's what I see. It's made out of metal letters. You can stand inside or even sit on a kind of bench inside. The view from Le Nomade over the Mediterranean Sea is breathtaking. It's definitely worth a visit. Cool place to see some lovely yachts! Would be better if you could walk a little closer. A really cool statue is located here which certainly is worth a visit! it is made from white metal characters and is definitely cooler to see in reality than on a picture! We were here right before a storm and got a really cool scene with the dark clouds rolling in from over the mountains in the far. Le Nomade (The Nomad) is the perfect sculpture for this place. Looking out to sea... contemplating the future... filled with possibilities. I love the fact that it is made of random letters. It is up to you to write your destiny. My advice is after you have taken your photos, spend a bit of time in quiet contemplation. That will complete the experience. That's what I did. Peace. Worth visiting when in Nice or Cannes.